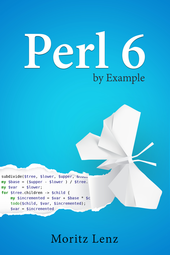 blog | Perlgeek.de :: Perl 6 By Example: Now "Perl 6 Fundamentals"
After some silence during the past few weeks, I can finally share some exciting news about the book project. Apress has agreed to publish the book, both as print and electronic book. The title is Perl 6 Fundamentals, with A Primer with Examples, Projects, and Case Studies as subtitle. The editorial process is happening right now. I've received some great feedback on my initial manuscript, so there's a lot to do for me.